The pyramids and cosmic rays appear to be linked. The pyramids might not have been built without this linkage. Contrary to theories of Egyptology the Giza pyramids were built 12,500 years ago, or earlier and were appropriated by the kings for whom they are named. Celestial evidence suggests that the 10,500 BC timeframe-theory is a more likely one than the consensus one upheld in Egyptology and history that is often bent to meet political and social requirements. The fact is, theories is all that we've got. One thing is certain, they were built before written languages were in use on this planet, so that nothing was written down. No inscriptions were found in the chamber. No names were chiseled in stone. No faces were carved into the walls of even the most prominent places. All remained pristine, blank, and unmarred. The only thing that was cast in stone is that the three pyramids in their layout and height match precisely the layout and the brightness of the stars of Orion's belt, and that the sphinx would face it own image behind the Sun on the winter solstice 12,500 years in the past. The interesting thing is that if this dating is correct, it placed the building of the pyramids within the timeframe of the end of the last Ice Age when everything suddenly began to change for the people. Most notably the cosmic ray density diminished to half of what it had been for a 100,000 years. While the ancients probably knew nothing about cosmic radiation, they appeared to have been able to feel that something was different. Had the Gods stopped speaking to them? We know as a fact that the cosmic ray density was double the density of today's value at the end of the last Ice Age. Would they have felt the difference? In general, almost 90% of all the incoming cosmic rays are protons, about 9% are helium nuclei (alpha particles) and nearly 1% are electrons. It's all common stuff. But their energy isn't. Cosmic rays can have energies of over 10^20 eV, far higher than the 10^12 to 10^13 eV that the best man-made particle accelerators can produce (up to 100 million times more energetic). But what does this mean? An ant that moves across a table (5½ feet) in 30 seconds produces 0.944 x 1012 eV or 0.944 TeV of energy. A cosmic ray particle does the same work. However, it does it in an infinitely shorter time and in an infinitesimally smaller space. It carries an immense punch for its extremely small space. Luckily for us all, with the cosmic ray particles, being as small as they are, and extremely fast, go right through a human body without touching anything. Every night, while you sleep, a million cosmic ray particles pass right through your body. You are unaware of this. However, they are electrically charged and leave an energy-trail in their wake as they pass through you and every other living thing. This energy might be an essential aspect of the development of life, and might be missed when it is diminished. The pyramids might have been created by the ancients to get the life-energy back that they have had throughout the ice age. To the very day we find systems of healing being practiced that employ four-sided crystals as healing instruments. The ancients might have made similar recognitions and have utilized 4-sided crystals for this purpose. Quarz crystals can have such shapes. The reasoning might have been that in a time of crisis that principle that works in the small works more effectively on the larger scale. 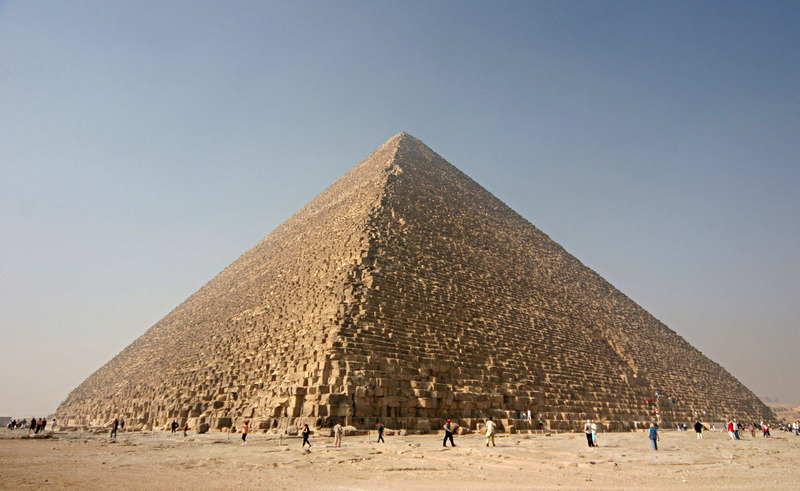 The great pyramid is certainly large enough to stop any cosmic radiation, no matter know intense, which would then permeate the entire structure and become concentrated towards the center. And there, near the center, we the main chamber constructed out of granite, which itself contains quartz crystals. The bottom like appear to be, that the entire giant construction appears to have been constructed essentially as a machine for concentrating energy for healing purposes. A machine that would give ordinary water a healing quality. And of course, in order to be in touch with the heavens where all good comes from according to belief, the structures would have to be in perfect alignment with the heavens in every detail for the principle to be most effective. Whether the ancient's hopes were fulfilled, whatever they were, will of course never been known. Nevertheless the probability is great that the pyramids were created for a down to earth productive principle, as an infrastructure, rather than for esoteric reasons such as a burial chamber, which millennia later the pyramids might have become. Over the years hundreds of books on pyramid healing and pyramid power have been written, some of which evidently testify of aspects of principles of life that still remain a mystery to us, so much as to evoke laughter. Nevertheless, as we begin to recognize the enormous energies that are packed into cosmic radiation, we begin to recognize that we are more closely and more directly linked with the various types of power that flow in the universe that enable us to express with out creative reason and productive endeavors a purpose for ourselves that is greater than ourselves, even to ennoble life itself. And so, as the world faces once again a period of transition, this time back to the Ice Age, we might yet discover the kind of advanced principles of life that will enable us to meet the Ice Age Challenge of providing food for billions when outdoor agriculture becomes widely disabled by the cooling climates. The exploration of cosmic radiation on living processes will certainly become a part of this stepping up to a new living environment. The pyramids may proof to be a useful research tool for that, in conjunction with space-based research, perhaps in facilities on the moon. I don't think we have the faintest idea yet what the biological growth potential is in optimized environments, such as by finding the optimum light color, CO2 concentration, background radiation, and possibly even electric charge potentials. In this manner, the pyramids may one day soon be seen in a totally new light. In the dynastic age we have the symbolic significance related to dynastic power. In the religious age we gave them religious significance. In the upcoming realistic age we may finally come to honor the ancients with a concept of humanity that we have not yet found in ourselves but are beginning to discover.